For a working individual, it can be hard to plan and execute a house move. After all, moving in itself is already a time-consuming process. What more if you add it to your already busy schedule? 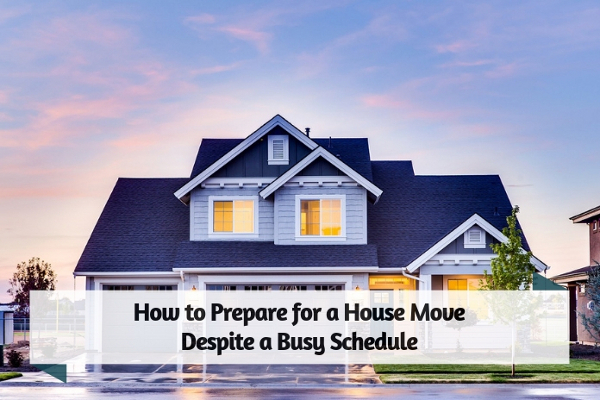 Despite a busy schedule, as long as you get the ball rolling early on, you will have enough time to prepare for a move. Once you have the final date of your move, start creating a list that contains all the things you need to do from the highest priority to the least. By starting early (about six weeks ahead or more), you can better manage your limited time and spend it on moving tasks to be more productive. Since time is your number one enemy, take advantage of services you can employ to do the tasks on your behalf. Instead of doing the move on your own, hire a local removalist to pack and move your entire house to your new place. This way, you can use your time for other responsibilities such as processing important documents. With a lot of tasks that need to be done, hiring a removalist is a smart way to save yourself from headaches. Since professional movers are specially trained to do their jobs well, you can rest easy knowing your relocation will go quickly, safely, and smoothly. Make sure that important documents such as house deeds, passports, and insurance documents will not go with the moving truck. On a busy moving day, it’s vital that you have access to supplies that will keep you hydrated, well-fed, connected, and comfortable. This way, you don’t have to get anxious rummaging through mountains of cartons just to find what you need. To ensure you cover all significant costs in a house move, budget your expenditure. Give the overall inventory of your items to your chosen removalist and ask for an estimate of how much your relocation will cost. Budget according to the given quotation while also allowing for some leeway for unexpected extra charges. If you want to save money during your move, compare costs between several removalists or movers and pick one that has the best price for quality moving service. When it comes to moving, things won’t always go as planned. With the limited time you have, it’s crucial that you’re flexible to any changes to keep your stress levels down. If you do encounter obstacles during your move, don’t panic and give yourself some breathing room to think about how to solve the problem at hand. Prepare your mind for the possible challenges you may face and have a backup plan. In case something gets postponed, you can bring forward other moving tasks to maintain your productivity without letting time (and effort) go to waste. Have a short walk around your new place especially if you’re moving to an area you’re not familiar with. This will make the transition easier and less overwhelming as you will begin to feel at home in your new house and neighbourhood. Moreover, this is an opportunity for you to book a cleaning session to ensure that your new home is ready for occupancy, and free from dirt and dust. Your first few days in your new place will be quite busy. Exploring the area in advance will let you know where to go in case you need to stock up on necessities. Starting early is the key to ensure that you have everything you need for the success of your house move. Additionally, you can avoid exhausting yourself trying to finish too many moving tasks in a shorter amount of time. For a stress-free move amidst a busy schedule, be sure to pace yourself and don’t leave everything to the last minute.